Jason Hartman is joined by author, Gordon G. Chang, to discuss the looming proliferation of nuclear weapons, particularly in North Korea. Gordon talks about the skepticism surrounding North Korean intentions, noting that the KNO-8 missile was unveiled and was to be transported on TELs, Transporter Erector Launchers, of Chinese design. He says it’s very likely the Chinese are arming the North Korean forces. The KNO-8 has the potential to reach Alaska and U.S. forces in the Pacific. It is considered a direct threat to our homeland and completely unacceptable. Listen at www.HolisticSurvival.com. Gordon feels there needs to be some very candid conversations about this issue. He talks about the instability and belligerence of the North Korean regime that doesn’t bode well for their relationships with South Korea and the U.S. With the hard-line, barbaric elements controlling the regime under young Kim Jong-un, it could take a half decade or more to establish a more stable North Korea. Jason Hartman: My pleasure to welcome Gordon Chang to the show. He is the author of Nuclear Showdown: North Korea Takes on the World, released by Random House back in January of 2006. Let’s talk about the scary possibilities that are going on in this region of the world and what maybe we should be thinking and doing about them as a country and a world community. Gordon welcome, how are you? Gordon Chang: Thank you very much. The thing that we really should be worried about, is not just the North Korea nuclear program, although that’s scary in and of itself, but the links between the North Korean and the Chinese militaries. And we saw this on April 15 at that massive military parade in [0:02:28.1] where the North Koreans unveiled a new missile which they designated the kn-08. Now that was interesting of course, but what was even more fascinating was that the kn-08s were being carried on transporter erector launches, or tells. And those were obviously of Chinese design because they looked identical to those that China makes. And afterwards we have learned a lot about how those erector launchers got from China to North Korea. So essentially the bottom line is that the Chinese and the North Korean militaries are cooperating very closely, the Chinese are arming the nuclear forces of North Korea, and the kn-08 is a game changer because it is rogue mobile, which means that it is hard to find, and it also probably, when it’s deployed, and it’s not deployed yet, but when the kn-08 is deployed it will be able to reach Alaska as well as US forces in the Pacific. So this is something we really need to think about because Beijing is one way or another helping the North Koreans target the United States. Jason Hartman: And this is just a slap in the face to the United States, China’s biggest trading customer, right? Gordon Chang: This is more than just a slap in the face. This is a direct threat to the American homeland. And there have been reports that the Obama administration did not raise this with Beijing because it didn’t want to embarrass the Chinese. Although the state department did say it was talked about in formal discussions. But we really need to talk to them not only in private, but in public. Because they’re proliferating technology that will be used, or could be used against the United States. So this is something which is completely unacceptable. And I don’t know how we deal with it, though I do have a few proposals. But none the less, the important thing is we need to have some very candid and some very tough conversations with the Chinese about this. Jason Hartman: You know Gordon, Obama and his administration have this reputation of being rather wimpy. Maybe especially when it comes to foreign policy. Is it founded? Is that a fair assessment? Gordon Chang: Well the Obama administration on some things actually has had a better policy than the Bush administration before it. On some other matters though, it seems to be going backwards. And Korea is a perfect illustration of this. President Obama had a very good policy with regard to the Korean peninsula, at least in the beginning. And that was to take a back seat to South Korean president Lee Myung-Bak who is a hard liner, very skeptical of North Korean intentions, and the Washington just didn’t play along with trying to appease the North Koreans. That changed, however, in the last few months as the Obama administration tried to reach out to the North Korean regime, and it didn’t work out. We had the so called Leap Day Deal announced on February 29th, which the North Koreans repudiated 16 days later because there was, as part of the arrangements in the Leap Day Deal, a moratorium on missile testing. And on march 16th they announced that they were going to fire off a long range rocket, which in effect was a test of the long range missile. And the Obama administration really didn’t do enough to first of all, prevent it, and also to exact consequences not only on the North Koreans, but the Chinese as well. So in this one area, Obama policy which started out quite good has now turned really to mush. And that’s going to be a problem. Because the North Koreans are starting to show these weapons that will target the US homeland. Jason Hartman: So this new Chinese supplied missile has enough range to get to where? Gordon Chang: First of all, it’s clear that the Chinese supplied the launcher. It’s not clear that they have actually supplied the missile. Though I think they did, because the Chinese sold these launchers and similar missiles as a package to Pakistan. And it’s likely that the Chinese have also sold the missile or the missile technology to the North Koreans. This missile, when it’s eventually deployed probably will be able to reach half of Alaska. With improvements in the missile range, it could even get farther than that. Jason Hartman: But not California? Or yes California? Gordon Chang: Not California. But North Korea is developing other missiles though that will be able to reach the northern part of the west coast. So we’re talking Washington State, Oregon, top part of California. Jason Hartman: What is the tenure of North Korea? They seem just as defiant and obnoxious as ever since Kim Jong Il’s demise. Sometimes when you have the demise of the old one, the new leadership loosens up a bit but not the case in North Korea? Gordon Chang: Not the case in North Korea and the reason is that we have Kim Jong-Un, who is Kim Jong-Il’s youngest acknowledged son. Kim Jong-Un is not even 30. He didn’t have much in the way of grooming. He’s taking over a position which is very risky. It’s a one man regime, but the one man regime is composed of four elements; the Kim family circle, security services, Korean workers party, and the Korean people’s army. And these various groups compete among themselves and it takes somebody who has been around a long time and has a lot of skill to be able to manage this type of coalition government. And so essentially, Kim Jong-Un is not prepared to do that. And so at this point at least, he’s a weak ruler. And that’s always a very dangerous situation when you have regime elements competing among themselves. So Kim Jong-Un, some people say he was educated in the west and so he should be liberal. We don’t really know what Kim Jong-Un thinks but we also know it doesn’t matter what he thinks because at least for the first several years, and probably longer than that, he will have to cater to the hard line elements in his regime. And that means we’re going to see a North Korea that is even more belligerent than what it has been in the past. Jason Hartman: And unfortunately he’s so young that this can just go on for decades if they don’t collapse before then, right? Gordon Chang: Right. It could take quite a long time. In hard line regimes, it always takes years for new rulers to consolidate their positions. We’re going to see the same thing in China, which is fated to have a leadership transition that is formally to begin at the end of this year. Even if it goes smoothly, which is pretty unlikely, given what’s occurred since February in China, it will take the new leader at least a couple years to be able to get his people into place and to be able to then start functioning effectively. In Kim Jong-Un’s case, it’s so much more difficult because the regime is less institutionalized and also because it’s a much more barbaric and tougher regime to manage. So we’re going to see an unstable North Korea for at least a half decade, maybe longer than that. And essentially it’s going to be a question of who consolidates power first. So there’s a great competition right now at the top of the North Korean leadership. And this doesn’t bode well for the North’s relationships with South Korea, the region or with us. Jason Hartman: I’m curious. I’ve watched a couple of documentaries about North Korea, and forgive me I can’t remember the name, but I watched the one about the mass games. And this country is fascinating to me. Number one I have this sort of morbid fascination with communism. I don’t know why; I’m such a capitalist. But it’s just interesting. I’ve visited Cuba and I’ve been to Russia. Unfortunately I didn’t go to East Berlin before they opened up. I would have really been fascinated by that. But I have been to Cuba, and would frankly love to go to North Korea if I felt I could do so safely and return. But what do the people think there? Are they just completely brainwashed? When I watched this documentary about the mass games, it seemed like the people were just totally brainwashed. You know, our supreme leader Kim Jong-Il, and they don’t know what they don’t know and they don’t realize how scarce their life is and how they’re lacking so many things. And then I watched another documentary that you may have also seen about the American soldier to defected to North Korea. I can’t remember his name, but a US army soldier, I believe he was in the army, and he just walked across the border into North Korea. And they viewed him and talked about his life there for so many years. Fascinating. Fascinating stuff. Gordon Chang: Well in the early years of North Korea, under Kim Il-Sung the founder, people actually were brainwashed. And people believed the propaganda. They believed that Kim Il-Sung was essentially a demi-god. But that monopoly on information has broken down, and so now people are starting to see prosperity in South Korea. They’re starting to see glimpses of the outside world, and this is because video cassettes and thumbnail drives are circulating around North Korea. Jason Hartman: They’re getting smuggled in, huh? They’re getting into the country? Gordon Chang: They’re getting smuggled in. And also the northern part of North Korea, the Chinese cellphone networks operate. So North Koreans can speak to their relatives in South Korea if they happen to specifically be along the border. And that certainly also has opened up North Korea. And as well as there’s been some limited contact with foreigners who have set up businesses. So essentially the North Korean people have a much better idea of what’s going on. Jason Hartman: How do they even get a hold of a cellphone or a computer where they can insert a thumb drive? It just seems like there’s so much scarcity there, I can’t even imagine people would have the money to have a computer, a cellphone. I suppose if there is government owned businesses they’d have computers, but it would be sort of surprising that they would even get access to devices to even use this information. Gordon Chang: There are a lot of ways they get this. And part of it is because the regime has really been very corrupt at its bottom, so a little bit of money can buy a lot. And although it is of course the most medically sealed government on earth, essentially people are able to come across the border with China because it is lightly patrolled, or at least it has been up until the last year or so. And that means there’s a lot of commerce with North Korea and China which is unofficial. And so North Koreans go into China, they trade, the buy up all sorts of things and they bring them back into North Korea. You’ve also got to remember during the great famine in the middle of the 1990s, essentially government broke down. And there was no government in large portions of North Korea, which meant that basically North Korea or at least portions of it were the freest society on earth, and so a lot of goods from the outside came into North Korea despite the very severe economic conditions and despite the famine that killed at least hundreds of thousands of people. So in these communist societies, there’s always a lot of money flogging around some place; especially in big cities. And so this sort of leaked through society. And at this point, because the border with China still is pretty open, you have all sorts of folks who go into North Korea try to proselytize them, try to make them Christians, human rights activists, all sorts of folks have been floating around the country side of North Korea, and with them they bring openness. And the last thing is because North Korea has needed aid, it is also meant that western food aid monitors have gone into North Korea. Foreign doctors have gone into North Korea. And that has sort of opened up the people’s eyes. Because for the first times in their lives they’re seeing foreigners being able to talk to them. And so there’s this contact which the regime doesn’t like, but the regime is not able to prevent it. Jason Hartman: So there is some sign of some opening up, some discontent, and possibly would that lead to a coup or a revolution? Gordon Chang: I don’t know if it will lead to a coup. Kim Jong-Un has continuing his father’s policy of Songun which is military first, and on April 15th, when Kim Jong-Un gave his speech to the North Korean people, he said that his policy was not just military first, it was military first, second and third. So the military probably sees that it’s future is tied to Kim Jong-Un who gives them some legitimacy because he’s a direct descendent of Kim Il-Sung. But there are other elements of course in society that are competitors to the military. And of course in the military it’s not a solid block; you always have ambitious kernels. The thing about North Korea that gives the regime stability though, is that people are so poor that they don’t really have the means to resist. And so essentially you’ve got a society where people may be extremely unhappy, and many of them are, but they are not thinking about trying to take down their government. They’re much more concerned about where their next meal is coming from. So you can try to switch with China, which is by far a much more prosperous society. But you’ve got a much more defiant population in China because people in China have gotten over that issue of where is my next meal coming from; they’re thinking about the bigger issues of wanting more say in their lives and being irritated by their government. So it is a very different society in North Korea. Jason Hartman: Sure, so they’re higher on the pyramid of Maslow’s hierarchy so they can start to think about other things beyond basic survival, which is good. In your other book entitled The Coming Collapse of China, Gordon, talk to us a little bit about that. That was published about 11 years ago I believe, right? Gordon Chang: Right. And I said in 2001, in the middle of 2001 that it would take about a decade for the communist party to fall, so I’m about 6 months out of time. But what we’re seeing right now though is very interesting developments in China. 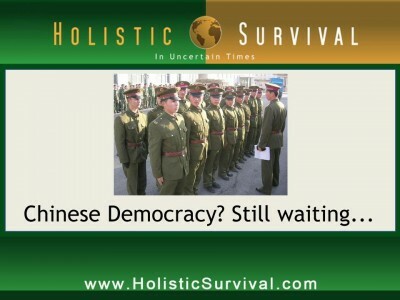 Because we have an economy that is stumbling, the communist party is fracturing, the authority of the central government is eroding, the military is breaking free of civilian control, and while all of this is happening, the Chinese people are taking to the streets, hundreds of thousands across the year and often in violent protest. So you have a society which is very volatile and communist party leaders right now are quite insecure because their political system is fragile and they know it. Jason Hartman: I don’t hear much about these riots in China though. Are they pretty suppressed? They’re not in the mainstream media that I’ve seen. Gordon Chang: Yeah the last year for which we have figures is 2010. And a semiofficial figure was that there was 180 thousand large protests in China, though other people say that there were 280 thousand protests. We’re talking about a large number of disturbances. And this is a supposedly authoritarian state. But clearly the Chinese people are unhappy with many things in their society, and this is really what happens when you have a prosperous authoritarian state. People start to question the government. This is especially a problem because in the last couple months, there have been only growth of maybe one or two percent. In April there was probably no growth, maybe even a contraction. In May, which is the last month for which we have statistics, growth was two percent, three percent at most. And three percent growth is okay if you’ve always had three percent growth. But this is a society which had double digit growth in 2010, that’s 10.4 percent officially. This is a society that had growth of 9.2 percent according to official statistics last year. So we’re dealing with a sudden deceleration of the Chinese economy. And if we want to know what the political effect of that will be, all we have to do is look at Suharto, Indonesia where you have an authoritarian rule, prosperity for decades, and all of the sudden growth collapses and then soon the political system is gone. That’s the story that China has to face right now. Jason Hartman: How much growth does China need to sort of break-even? Their demands for GDP growth are much higher than US demands, right? Because of the population and because of so much immigration from rural areas. Is that still happening in China? I know when the financial crisis hit over here, which was obviously really a world crisis, I remember seeing news reports and amazing videos of people leaving the cities and going back to the rural areas. That was shocking to me. But what kind of growth rate do they need? What kind of number do they need to achieve? And of course, these are official numbers and I’m sure just like in the US they’re maligned and very debatable but we’ve got to sort of put a number somewhere. Gordon Chang: People say that China needs about eight percent growth. It might need seven and a half, six. That number is going to come down though because the work force is going to start to shrink sometime starting either between 2013 or 2016, probably in the front end of the range because demographic trends in China are accelerating. But China needs a fair amount of growth, because it is in the early stages of development, so you’d expect to see pretty high growth rates. And zero growth, one percent growth, even three percent growth isn’t going to do it for China. The problem was that they were not able to change the basis of their economy away from investment and exports and towards domestic consumption. They didn’t do that in the really good times 5 years ago when everyone was telling them that that was job one for them. And they’re certainly not going to do it now in a declining, deteriorating economic environment. China right now is a problem because you don’t have the world taking Chinese exports to the same extent. And that is going to be an issue for China because they don’t have the domestic consumption to support themselves. Jason Hartman: Wow. I guess the big question, and I guess this is the kind of wrapping things up discussion, what is the outlook for China and North Korea in terms of their perspective and then what the US should do about it and how the US should react. Gordon Chang: I think the outlook here is two developments are going that are very dangerous. One of them is that not only do we have leadership transitions in both North Korea and China going from one set of rulers to the next, but we also have changes in the nature of their regimes. And essentially what’s occurring is that the militaries in both of these countries are becoming much more powerful and that means that anything can happen. 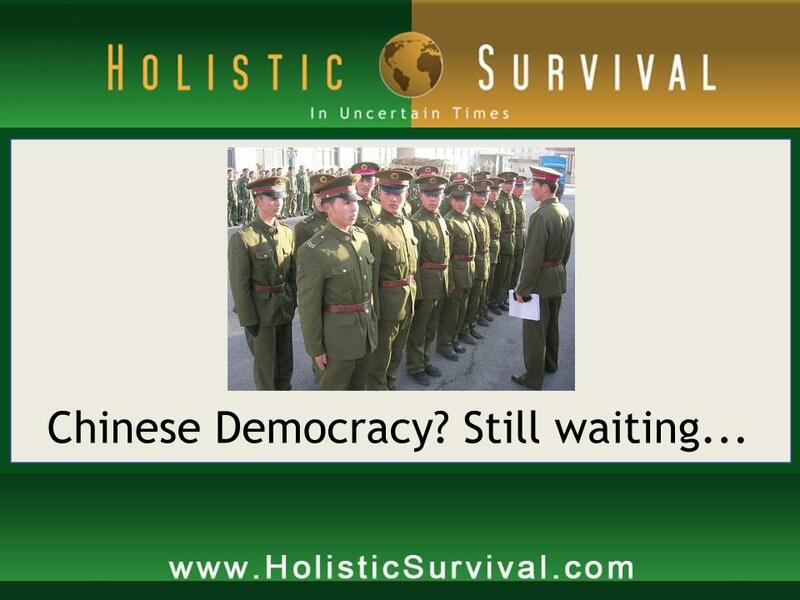 China has become much more assertive and even hostile. Which is why countries in the region are looking to the United States foreign leadership, because they are concerned about China’s trajectory. So we have an increasingly assertive China backing a much more belligerent North Korea. And that means all of us are at risk. Jason Hartman: And what should we do about it? Gordon Chang: We need to be much more resolute. We need to stop looking at China as a solution for North Korea, because then we always let the Chinese leaders to reign in their North Korean allies. The problem is that the Chinese leaders seem to be enabling the North Koreans rather than trying to contain them. And basically the United states needs to have a new policy of trying to work with its friends in the region instead of working with North Korea’s best friend, which is China. Jason Hartman: Scary stuff. How close do you think North Korea is to a nuclear weapon? Jason Hartman: I guess I should have said a nuclear missile, sorry. Because I know they had that missile launch a couple of months ago which was a failure, not a weapon but a delivery system for it. Gordon Chang: In 1998, they launched their Taepodong missile which basically made it all the way to Alaska before it broke up in the transition from the second to the third stage. Their most successful long range missile test was their first. And the test that they had in 2006 and in 2009 were not nearly as successful. The North Koreans can make bold substantial progress very quickly. And remembering last year, then defense secretary Robert Gates said that within 5 years the North Koreans would have a long range missile that would be able to reach the continental United States. And he didn’t say it, but what he was thinking was that missile would be able to carry a nuclear warhead. Jason Hartman: Wow. We’ve got to make sure that doesn’t happen, huh? If they have that, are they just going to use it as a way to incite a war? They know that would lead to certain mad mutually assured destruction, well not mutually but it would lead to their destruction for sure. What would they do if they had the complete capability to deliver a nuclear missile to a major American city for example? What would they do, would they use it? Gordon Chang: I think they thing that they would do is what they have been doing up to now, which is selling their ballistic missile and nuclear technology to the Iranians. And this is why this is so important to us and North Korea. Jason Hartman: And what would they do? Gordon Chang: That’s another good question. Certainly use it to threaten their neighborhood to try to get confessions, which is what the North Koreans would do. They might also use it, and the North Koreans could use it. But we don’t’ know what they’d actually do with their weapons, but we do know that they’ll sell them. And this is a problem because it’s very difficult to contain these very dangerous technologies when they North Koreans, backed by China, are selling this stuff around the world. Jason Hartman: Scary stuff. Well Gordon Chang, thank you so much for joining us today. Your books are the Coming Collapse of China, and Nuclear Showdown: North Korea Takes on the World. Give out your website if you would. Gordon Chang: It’s www.GordonChang.com and my Twitter handle is @GordanGChang. Jason Hartman: Lots of interesting articles there. Gordon Chang, thanks so much for joining us today. Announcer: What’s great about the shows you’ll find on JasonHartman.com is that if you want to learn how to finance your next big real estate deal, there’s a show for that. If you want to learn more about food storage and the best way to keep those onions from smelling up everything else, there’s a show for that. If you honestly want to know more about business ethics, there’s a show for that. And if you just want to get away from it all and need to know something about world travel, there’s even a show for that. Yep, there’s a show for just about anything, only from JasonHartman.com. Or type in “Jason Hartman” in the iTunes store.